Located just to the south of Dayton, Kettering, Ohio, is considered to be the largest suburb of its more well-known neighbor. Upon closer inspection, however, Kettering has developed the credentials to make it a first-class city in its own right. Home to more than 54,000 people, Kettering has few rivals when it comes to its park system, which has received many accolades for in its innovation, diversity and planning. In fact, the American Academy for Park and Recreation Administration, in partnership with National Recreation and Parks Association, named Kettering’s Parks, Recreation and Cultural Arts Department as one of its four Class IV finalists for the 2014 National Gold Medal Awards for Excellence in Park and Recreation Management. Winners will be announced at the nrpa congress Oct. 14–16. On being named a gold medal finalist, Kettering Parks, Recreation and Cultural Arts Parks Director Mary Beth Thaman offered tremendous praise for the staff she directs. Thaman attributed her department’s success to the supportive residents and leaders in the community. She also pointed to the legacy that her predecessors left for her, noting that the existing department began as a volunteer organization started when the city was established in 1955. “The fabric of the community has a great deal to do with our continued success,” she added. Indeed, the Kettering Parks, Recreation and Cultural Arts Department has been the beneficiary of a supportive community. In 2008, a $12.5 million bond levy was approved by 70 percent of the voters to improve the infrastructure of the city’s parks and recreation facilities. Additionally, the Kettering city government offered $5 million to the project and an additional $1.2 million was procured to install a retractable roof over the city’s indoor swimming pool. From 2009–13 more than $19 million was spent building improving the infrastructure of the Kettering parks system. 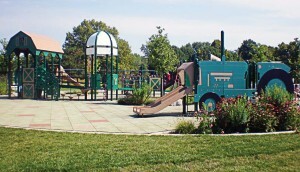 The improvements consisted of an update of 22 of the city’s parks to feature themed playgrounds; renovation of a 3-acre outdoor water park; an update and addition to a 152,000 recreation complex; construction of a network of walking paths throughout the city; and the development of other fitness opportunities for Kettering’s residents to enjoy. A large splash pad, skate plaza and, most recently, a Habitat Environmental Center were built. The HEC is intended to become an educational resource for those who desire to learn or teach about the environment. The skate plaza is the first of its kind, featuring approximately 40,000 square feet of area and incorporating urban terrain elements such as benches, rails and ledges. According to the department, “unlike most modern day skate parks that consist of stark vertical ramps and half pipes, the skate plaza resembles a public square in a town or city by incorporating landscaping and art to create a multi-use park that is aesthetically pleasing. The park is named after Kettering native and professional skateboarder Rob Dyrdek, who met with the city during the planning stages. Dyrdek’s father, Gene Dyrdek, said that at one point he heard Kettering was looking at building something for skateboarders and kids were being asked to come in and give their input. The younger Dyrdek began working with the city staff and Site Design Group Inc. to design the skate plaza and help secure funding for the project. After several revisions to the design and content of the skate plaza, plans were created that satisfied everyone’s needs. In addition to the many facilities catering to the younger generations of Kettering, the parks department also offers programs through its senior center, a multipurpose facility dedicated to providing quality programs and services to the older members of the Kettering community. The senior center offers its members access to the attached recreation center’s swimming pool, gymnasium, walking track and ice arena. It also sponsors programs on travel, sports and fitness, plus health and wellness. Thaman also pointed out the Land Lab Nature Program, which provides environmental education opportunities to more than 3,000 elementary-age children in the city. The philosophy of the is to involve educators in the process of educating children and young adults about nature and is a cooperative effort between the local school district and the parks department. “We have developed a sophisticated approach to making the most of our revenue stream,” said Thaman. “We’re very selective with our product purchases and their placement.” She added that they have been blessed with good land acreage and facility designs. Thaman praised the community, pointing out that the public has been extremely receptive to the programs and facilities offered by her department.